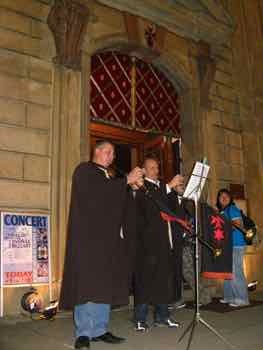 We went to Prague to see the city and its history, but music in Prague is part of the fabric of the city. It seems to be everywhere. I remember saying I had never seen a city where everyone seemed to be walking around with a musical instrument of some type under their arm. And that's what we suggest to all of our friends. Whoa... wait a minute, you're saying. "I'm not an opera buff." We're not either, and we don't usually go looking for musical performances when we travel, but music in Prague just called out to us. 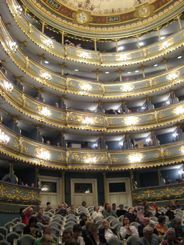 Back to that opera... We went to see "Don Giovanni" in the Estates Theatre Prague. This jewel box of a theater opened in 1783. Here's the clincer... This is the theater where Mozart himself conducted the world premiere of his opera Don Giovanni in 1788, back when the theater was called the Nostiz Theatre. The building was beautifully restored for the movie Amadeus. According to their website, this is the only theater in the world that is still in its original condition. To see Don Giovanni performed in the Estate Theatre is to share in history as well as sharing great music. Whether you're an opera buff or not, it's a fun experience. We were lucky to get great seats for a matinee on the day of the performance..., but if your time in Prague is short, you might want to buy tickets ahead of time online. If you want your opera in a really different setting, you could see one at the National Marionette Theater or a handful of other puppet theaters. It seemed like there were several inexpensive concerts every evening. Many churches had concerts, and there are several concert halls. If you love classical music, you've got to get to Prague. There are concerts with the "best of" classical pieces, so even if you're not "into" classical music, you'll hear music that you're familiar with. You can hear organ concerts, chamber music concerts, or full orchestras. There are concerts with show tunes and popular music too. None of these are not long drawn out affairs. Most of these nightly concerts are about an hour long. For reasonable prices it's a great way to spend an evening before you go for an evening stroll in the old town or on the Charles Bridge. In the summer there are concerts on the steps of the National Museum and some of the gardens. There are even musical groups on the corners and in the squares. 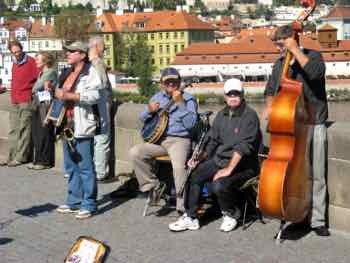 All kinds of musicians crowd the Charles Bridge. Or sit in a square and have a Czech beer and listen. There also seem to be many small jazz clubs and music clubs scattered around the city. The biggest annual musical event is the Prague Spring International Music Festival. It includes musical artists, symphony orchestras and chamber music ensembles from all over the world. For an event like that, you should probably by your tickets in advance.